Did you just get a new Kindle Paperwhite? You’ve made a great choice — the Paperwhite offers the best combination of features and value for money and you’re going to love using an eReader. But if you don’t know how to start using your device, you’ve come to the right place. 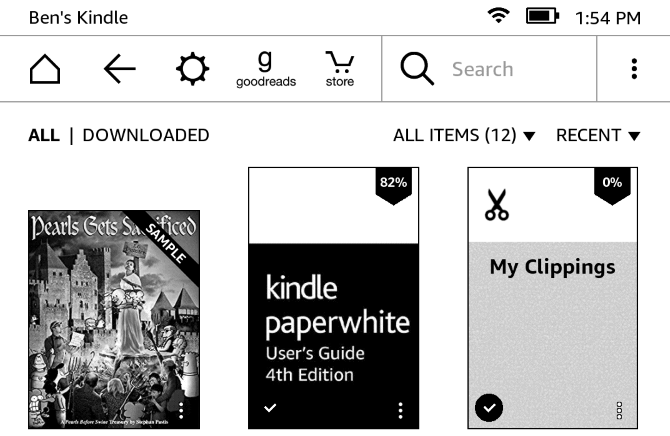 Read on to discover everything you need to know about using your Kindle Paperwhite, including how to set it up, how to get the most out of it, and how to fix common issues. The Kindle eReader (hereafter referred to as just Kindle or Paperwhite for brevity). A microUSB 2.0 cable (wall charger not included). 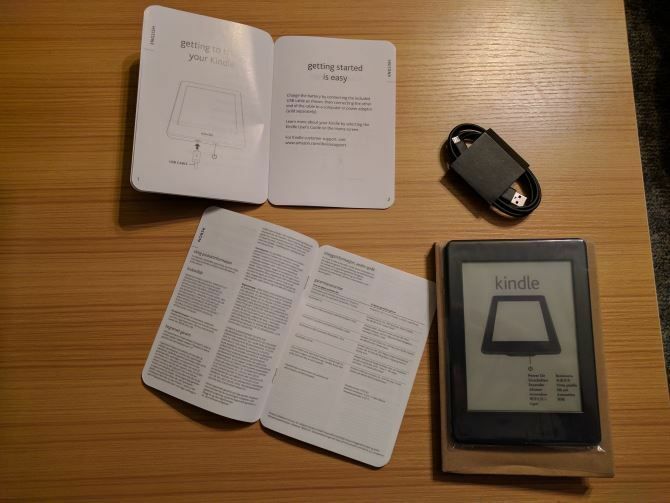 The quick setup guide, which essentially just tells you to plug in and turn on your Kindle. You might notice that there’s no USB wall charger included in the box. Amazon assumes that buyers have an extra one sitting around since so many phones, tablets, and other devices use them. If you don’t have one, you can buy a basic one on Amazon or just charge your Kindle using a PC. It only needs charging every few weeks, so it’s not like you’ll have it tethered to the wall all the time. Plug in your Paperwhite and let the battery charge fully. When you’re ready, press and hold the Power button at the bottom and let it power on. In a second, you’ll see the beginning of the setup process. Tap your language and then give the Kindle another moment to load up. If you see the screen flash, don’t worry — that’s a normal part of e-Ink technology refreshing. Tap on the screen once you see the Kindle welcome message. First, you’ll need to get your device connected to your home Wi-Fi. Tap Connect to Wi-Fi and your Kindle should find your local network name. Tap it, then use the keyboard to enter your network password. 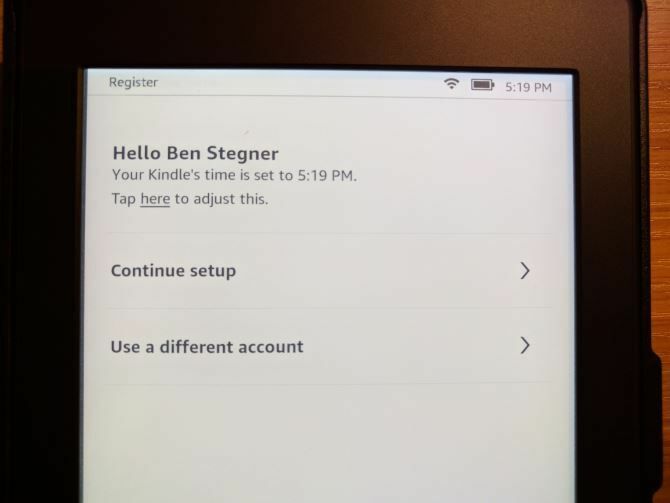 Now that your Kindle is online, you need to connect it with an Amazon account. Assuming you have one, tap Use an existing Amazon account. If you don’t, hit Create a new account and follow the steps there. Type your Amazon account email and password, then tap Register. Those who use two-factor authentication on their Amazon accounts will see a prompt to enter their code after pressing Register. If you see an error, make sure you typed your email correctly, as it’s easy to make a mistake. Once everything clears with your Amazon account, you’ll see a Hello message with an offer to adjust the device time. If you’re in the U.S. this will probably be set to Pacific Time by default, so tap the here prompt and set the correct time for your area. Then tap Continue setup. You’re almost there! The Paperwhite will next ask you to connect your Facebook and Twitter accounts to your Amazon account. This lets you share wish lists, reviews, and more. If you don’t want to do this, tap Connect Later — it’s not required. 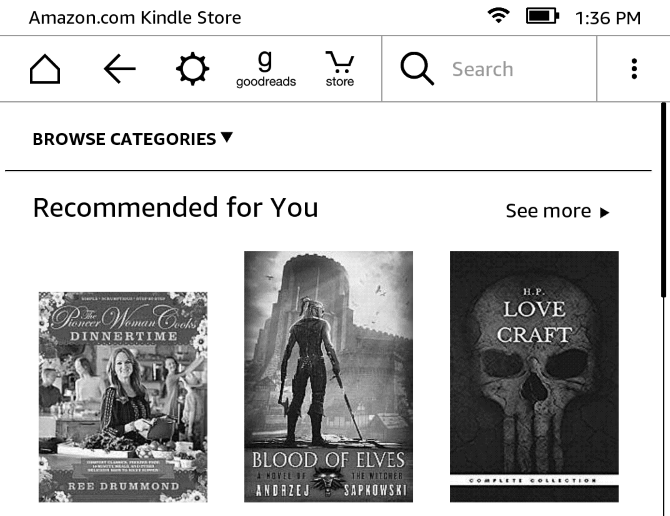 There’s one more account Amazon wants you to connect to — Goodreads. This free service lets you track books that you’re reading and want to read. It lets you connect with friends and offers personal recommendations once it knows a bit about your preference. 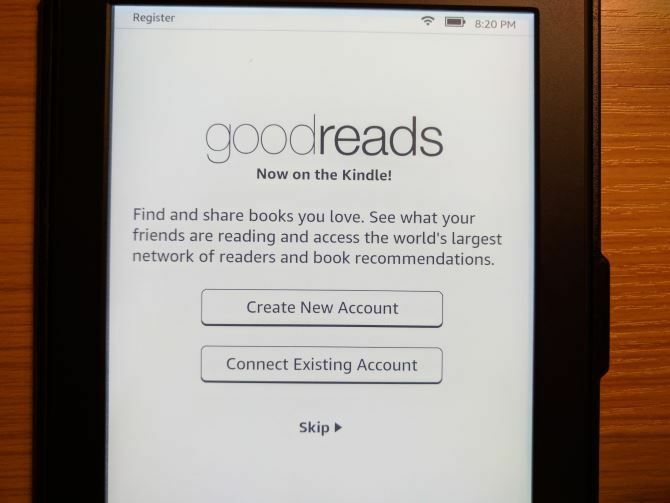 Tap Connect Existing Account if you already use the service, Create New Account if you don’t have one, or Skip to pass on using Goodreads. Finally, you’ll see an offer to try Kindle Unlimited, Amazon’s all-you-can-read service. This costs $10-per-month and lets you choose from over a million books as long as you’re a subscriber. You can start a month-long free trial, so check out our review. Tap No thanks to pass for now. The toolbar at the top of the screen allows you to move around your Kindle. If you don’t see it (like when reading a book), tap near the top of the screen to expose it. Tap the Home icon to jump back to your homepage, with your current books and links to new ones. Use Back to go back one step to where you just were. For instance, if you were on the Top Sellers page and tapped on a certain book, tapping Back will take you back to the Top Sellers page. 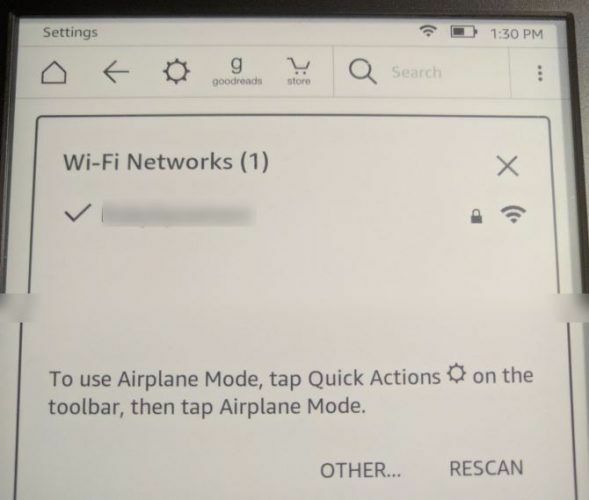 Airplane Mode will cease all wireless communication so your device isn’t connecting to Wi-Fi. This is useful for saving some battery when you know your device won’t be online. 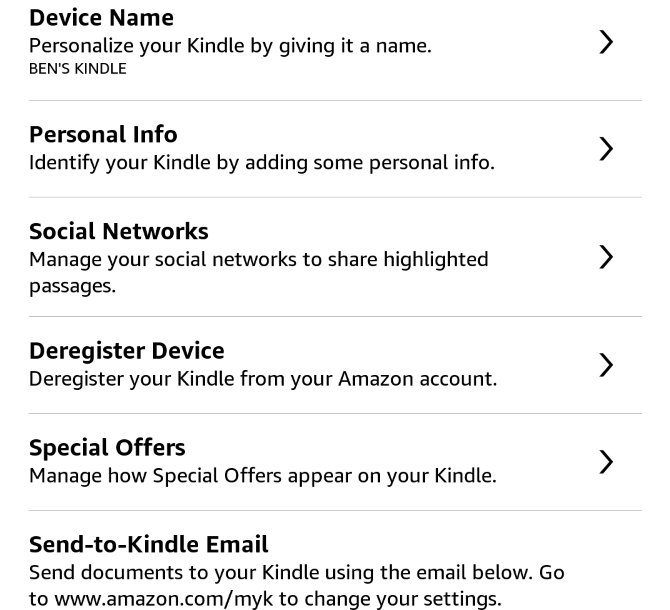 Sync My Kindle will update your device with any purchases from other devices on your Amazon account. This also happens automatically in the background. Use the Light bar to adjust the backlight from a value of (off) to 24 (max). If you’re having trouble tapping a specific square, tap the left sun icon to lower the brightness by one and the right icon to raise it by one. Tap the All Settings gear to open the full Settings menu, which we’ll discuss later. 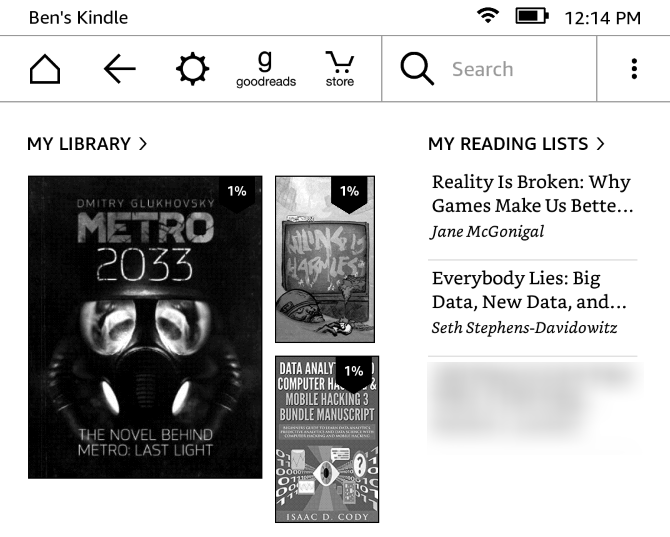 The left side Home screen shows your recent books — both those you just downloaded and read. On the right side of Home, you’ll find books that are your Amazon Wish List. It also holds those on your Want to Read Goodreads list and any free samples you’ve downloaded. The lower part of Home shows recommendations for you. After this, you’re dropped to the Home screen. 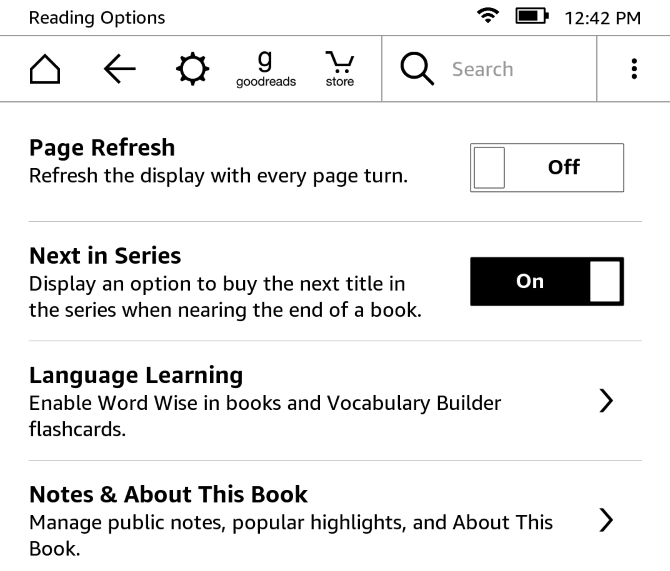 Now you’re ready to purchase books and read them on your Kindle! Amazon’s library of Kindle books is massive. No matter what genres you have interest in, you’re sure to find something you’ll like. Tap the Store button at the top of your screen to have a browse. You’ll see Recommendedtitles at the top, along with Best Sellers, New Releases, and more in the store. Tap Browse Categories if you’re looking for a specific genre. Also, you can tap the Search bar and look up a book at any time. Once you’ve found a book you’d like to read, tap it to view its product page. This will show you how many pages the book is, when it was released, and more. Scroll down to view a brief description and reviews to make sure it’s something you have interest in. If you’re not sure, many books have a Try a Sample option so you can start reading the title before you buy. Tap this button and your Kindle will deliver a sample to your home screen. When you’re ready, tap Buy for $X to purchase the book. This is a one-tap process, so be careful not to hit it by mistake! When you buy a book, you’ll see a Cancel button appear, which you can tap if the purchase was an accident. Then, after a moment, your Kindle will download your book to your device and you can start enjoying it. All purchases you make are stored in the cloud for your Amazon Account. 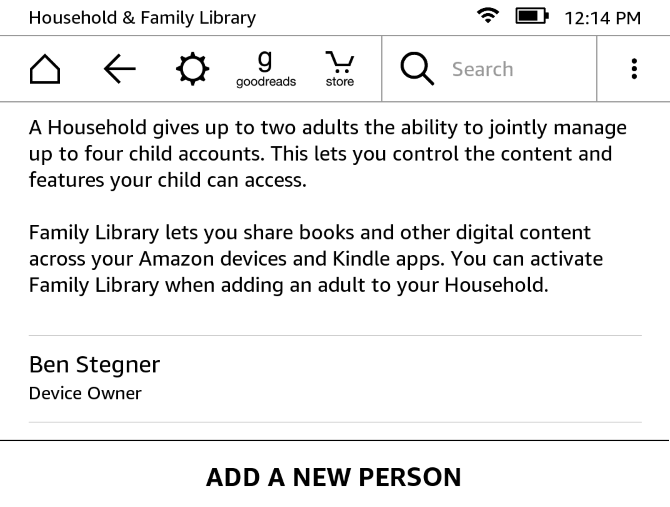 This means you can download them to the Kindle reading apps on other devices, or re-download them on your Kindle if you need to. If you don’t have much money to spend on Kindle books, there’s plenty of free content out there too! Of course, since your Kindle can only display black and white, you’re better off buying art books or anything with lots of color pictures in physical form instead. Once you’ve downloaded your book, return to the Home screen and you’ll find it on the left side. Tap My Library to view all your books if you don’t see it. Tap on your book and it will launch you into reading mode. As you’d expect, actually reading a book is pretty simple. Tap anywhere right side of the screen to flip to the next page. Similarly, touch the left side of the screen to go back a page. You can tap the top part of the screen to bring open the toolbar, which offers the same Home, Back, and other options we discussed before. 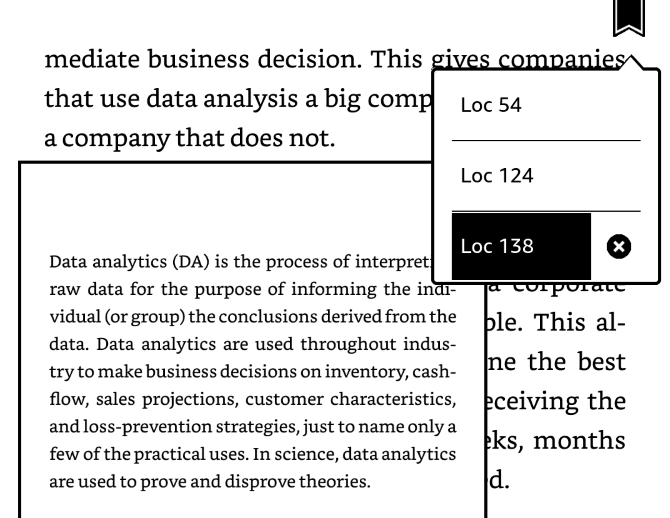 However, when in a book, the toolbar lets you tweak several reading options to make the experience more pleasant. Tap the Aa icon to change font options. 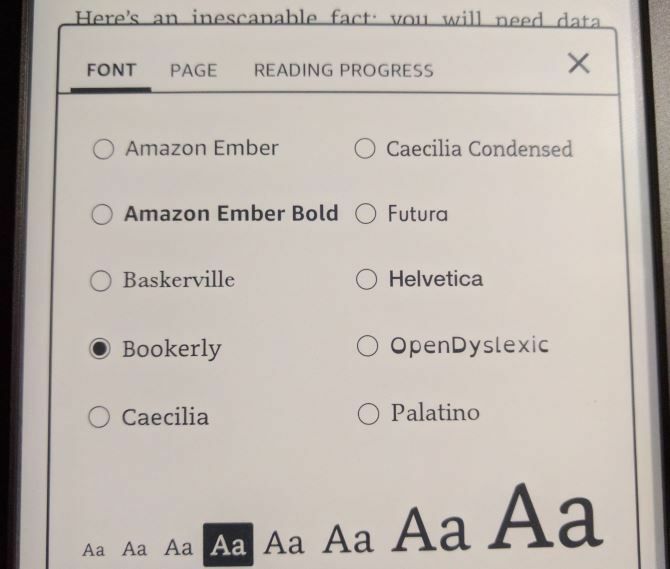 You can select from several font styles and sizes. Hit the Page header next to adjust the line spacing, margins, page orientation, and text alignment. Finally, the Reading Progress header lets you change the little indicators at the bottom that let you know how far along you are in the book. By default, this is set to Location, which displays Loc 123 in the bottom-left-hand corner while reading. 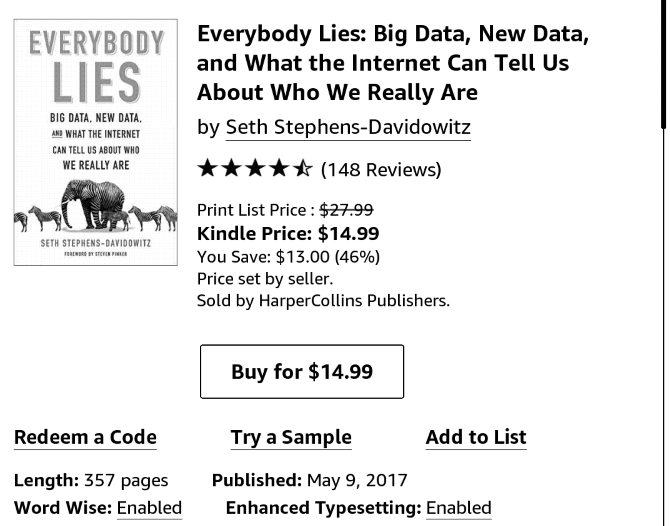 Page numbers are essentially irrelevant with Kindle books due to the amount of ways to change what’s displayed on-screen. Thus, location provides another way to track your progress. If you don’t find it useful, you can change this to Page in book, Time left in chapter, or Time left in book. The bottom-right will display your percentage of progress through the book. So now you know how to access books on your Kindle, but there are many more tools and ways to navigate beyond the basics. Let’s review them so you can take full advantage of your Kindle. Do you want your kids to read more often? Letting them use your Kindle is a great way to do that. 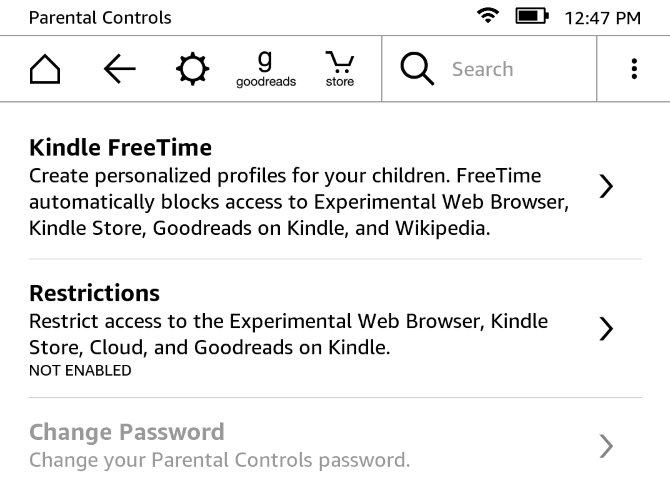 A feature called Kindle FreeTime lets you restrict access to the store and web browser. Your children can only read books that you’ve specified. To get started, press the three-dot Menu button on the right side of the toolbar and tap Kindle FreeTime. Press Get Started, then you’ll have to set up a few parameters. Set a Parental Controls password if you don’t have one already, then enter some basic information about your child to create their profile. After this, you can select the books in your library that you’re allowing your child to read. If you like, you can adjust their access to achievements (which reward them for reading) and change their daily reading goal from 30 minutes. When it’s time for them to read, simply go to Menu > Kindle FreeTime and have your child select their name. To exit, visit Menu > Exit Kindle FreeTime and enter your password. 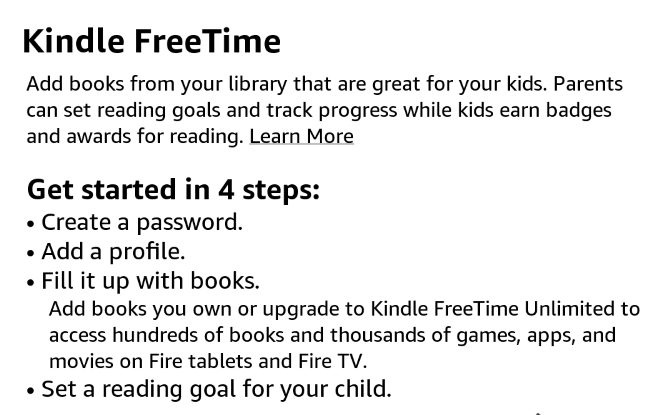 Check out Amazon’s Kindle FreeTime Unlimited plan if your children are avid readers. Head to Menu > Vocabulary Builder to access this neat tool. While reading, you can press and hold on any word to look up its definition. Any time you do that, your Kindle adds the word to this list for later review. Here you can tap words to review their definitions or work with some flash cards to finally master them. Did you know that your Paperwhite includes a basic web browser? It isn’t meant for playing games or watching videos, but will work for casually browsing the web. Unsurprisingly, Flash doesn’t work here, and everything is in black and white. Still, if you want to read a blog or check the news with your Kindle, it’s possible. And if you need somewhere to visit, check out the most important websites for Kindle owners. You’re not sure what a word means while you’re reading? No problem — just long-press on it for a moment and you’ll see a pop-up with its definition. Slide the box over to access the Wikipedia page on the word, as well as a translation utility. 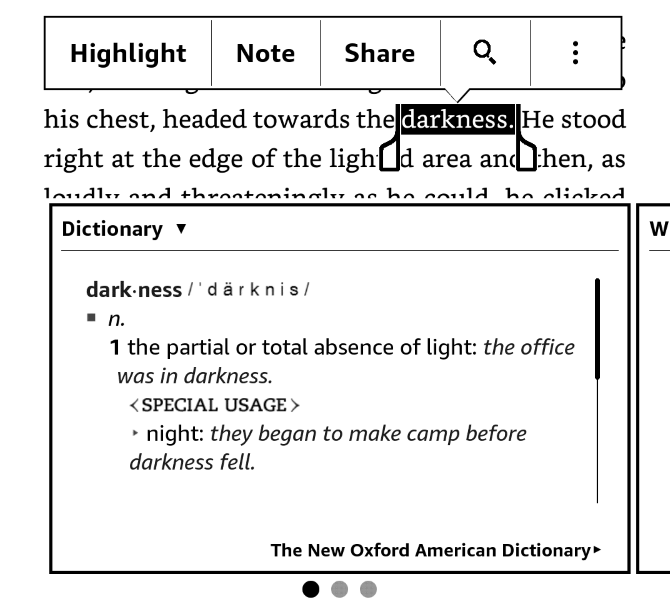 To launch the full dictionary, tap the three-dot Menu button below a highlighted word and tap Open Dictionary. When you long-press on a word, you can also tap the Highlight or Note buttons to mark passages for later. Use the handles around the text to select exactly what you want. To highlight directly, just drag your finger over some text. Tap the Go To button on the upper toolbar and you can jump to different locations in the book. You can head to the Beginning or Table of Contents, or enter a specific location/page number. Tap Notes to check out the highlights and notes you’ve added previously. You can also bookmark pages without needing to use scraps of paper. 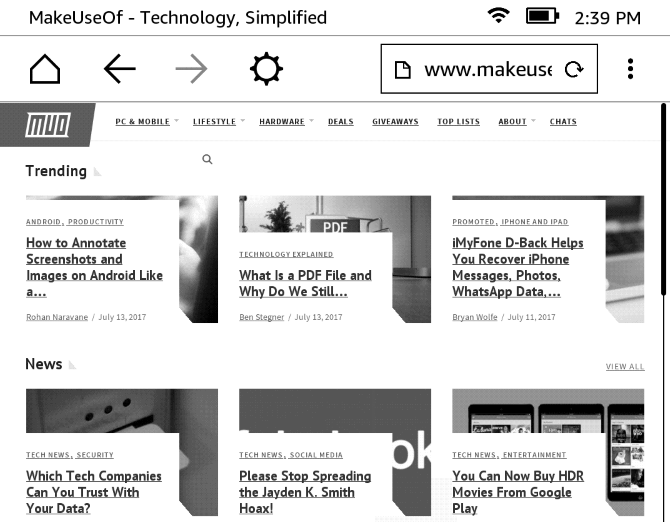 Tap the upper-right corner of any page to bring up the bookmark menu. You’ll see a list of other bookmarks; tap the + (Plus) icon to add a bookmark on your current page. If you tap an older bookmark, you’ll see a preview of that page and can tap it to return there. Whenever a current page is bookmarked, you’ll see a black bookmark in the upper-right corner. To scroll through many pages at once, tap the top of the screen to open the toolbar. On the bottom of the screen, you’ll see two buttons. The left one lets you preview one page at a time as you use a slider to scroll to a specific location. Tap the right and you’ll see a grid of all the book’s pages. Scroll using the slider below and tap a page to jump to it. In either case, tap the X in the upper-right corner to close and return to your original page. X-Ray is a feature that Amazon describes as letting you “get to the bones of the book.” It’s not available for all titles, but it’s still a great help. Open the toolbar and tap X-Ray (next to Go To) to access it. The feature will find notable clips in the book, as well as important people, terms, and images. Tap People or Terms, and you can see how many times certain characters and terms are mentioned. You can use this to quickly get a bearing on the book’s big ideas, or to refresh your memory on who a certain character is should you forget. Less time recalling past events, means more time for reading, which is always good. 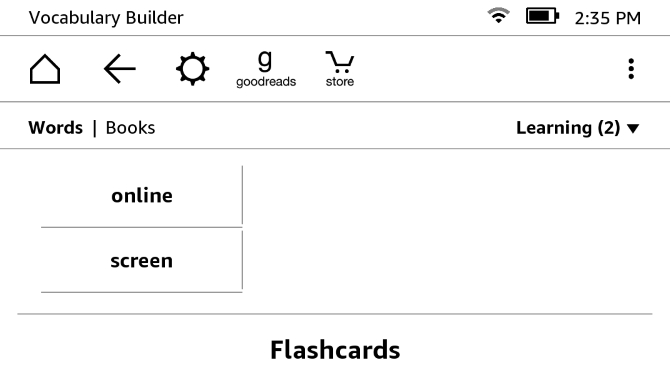 Tap the Goodreads icon on the toolbar to open its interface. You can rate titles you’ve read and get new recommendations if you’re looking for something fresh. 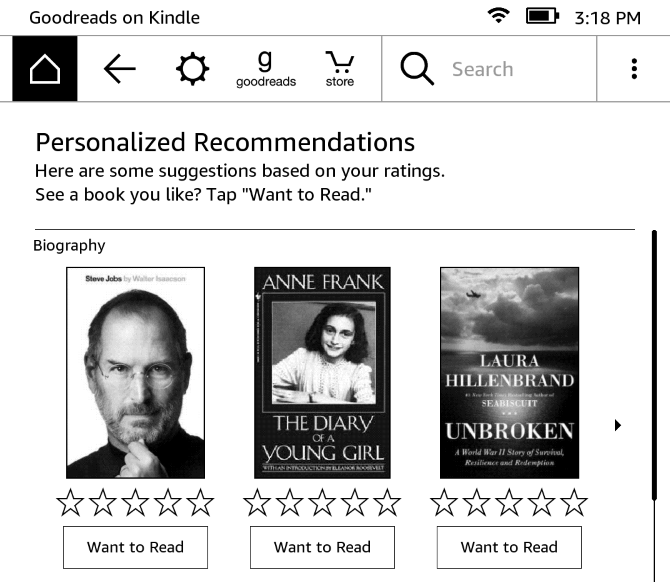 Your Kindle has some options you should adjust to your liking for best results. Let’s look at what they do. To access these, tap the Settings gear at the top of the screen and choose All Settings. You can also tap the three-dot Menu button and choose Settings. Device Name: Change the default [Name’s] Kindle to something different if you like. Personal Info: Add some info to identify your device. You can add your email address or phone number here so it’s easier to return if lost. 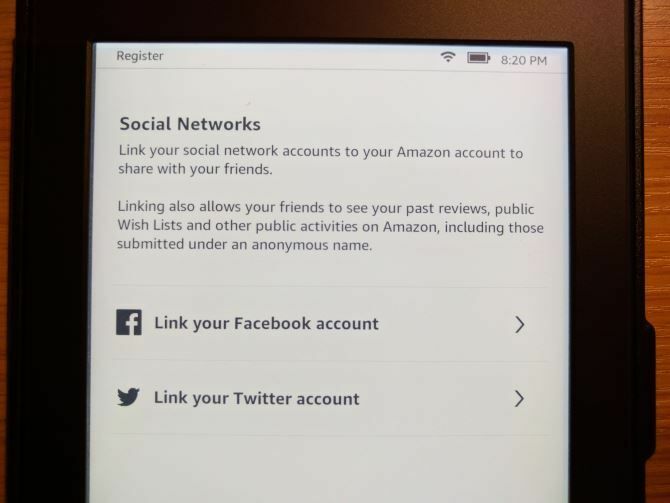 Social Networks: If you didn’t connect to Facebook, Twitter, or Goodreads earlier, you can do so here. Deregister Device: Use this to disconnect your Kindle from your Amazon account. Useful if you’re selling or upgrading your Kindle. Special Offers: Allows you to hide special offers that may be inappropriate for some audiences or hide personalized recommendations. Send-to-Kindle Email: Lets you view a special email address that you can email PDFs and other documents to. Anything this inbox receives will appear on your Paperwhite. Here, you can set up a Household. This lets you and another adult — plus up to four children — join up to form a family account. Using this feature, you can share books across your Kindles. You obviously must add another user to your account to use this. Visit this section if you need to change your wireless options. When you open it, you’ll see all the Wi-Fi networks nearby and can join them just like you did during setup. 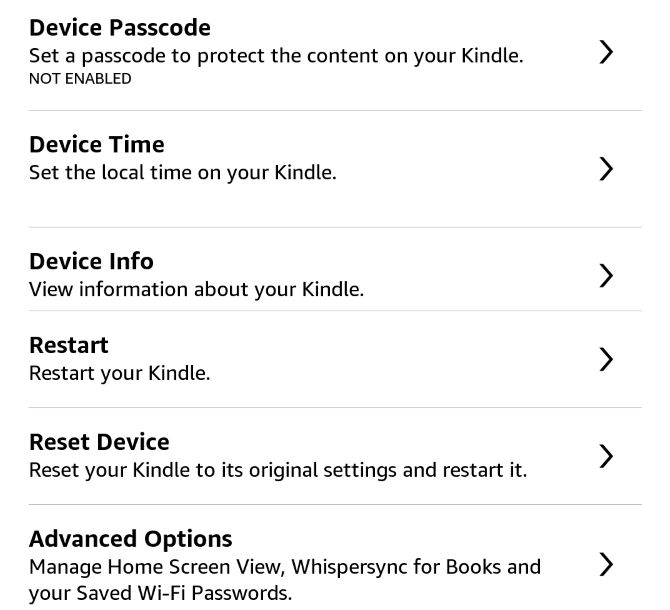 Device Passcode: Set up a passcode so other people can’t use your Kindle without permission. Device Time: If your Paperwhite’s time is incorrect, fix it here. Device Info: View basic info about your device, such as its serial number, firmware version, and available storage space. Update Your Kindle: Install the latest software update for your Kindle. It should automatically do this when charging in sleep mode, but you can use this to manually check for one. If this option is grayed out, you’re up to date. Restart: Power cycle your Kindle. You should do this if your device seems sluggish after long periods of use. Reset Device: This will delete all content on your Kindle and reset it to the factory defaults. Don’t do this unless you’re selling or giving away your device! Home Screen View: Disable this to turn off recommended content on the Home screen. 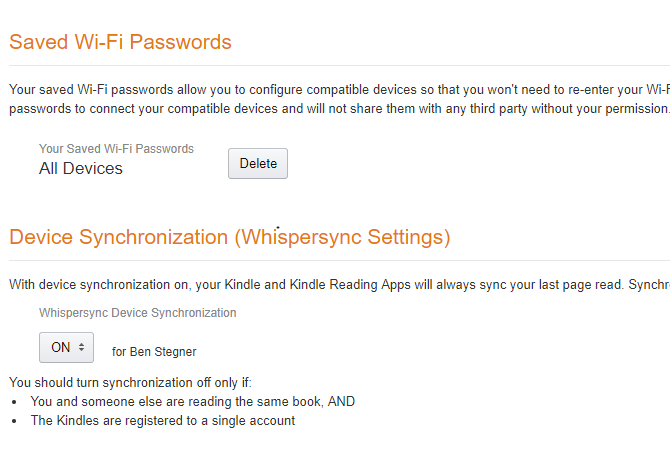 Whispersync for Books: Enabled by default, this is Amazon’s feature for syncing your progress across devices. It allows you to pick up on your Kindle where you left off reading on your iPad, for instance. Keeping this on also backs up your notes. 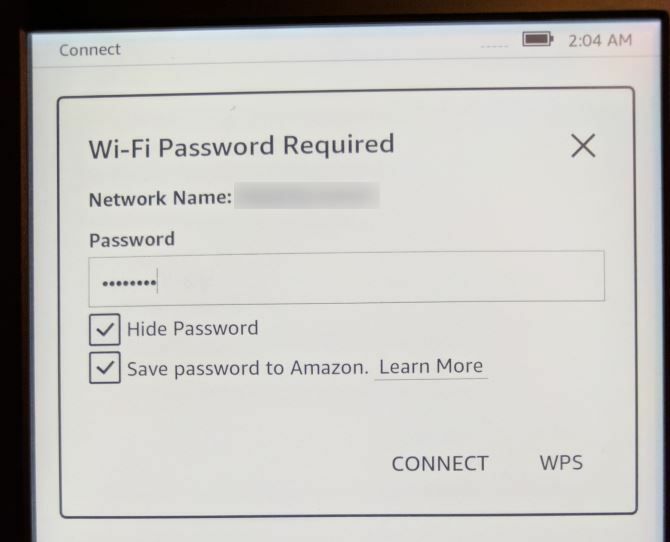 Delete Wi-Fi Passwords: If you’ve saved any Wi-Fi network password to Amazon for convenience, you can remove those here. Page Refresh: Disabled by default, turning on this setting will make your Kindle completely refresh the display every time you turn the page. This may help with “ghosting” images, but will also negatively affect battery life. We recommend leaving this off unless ghost images are impacting your reading. Next in Series: With this enabled, whenever you’re almost done with a book, you’ll see a prompt to buy the next one in the series. Language Learning: This enables you to turn on the Word Wise feature to help with unfamiliar words, as well as the Vocabulary Builder feature to help you learn words. We’ve discussed both of these elsewhere in the guide. 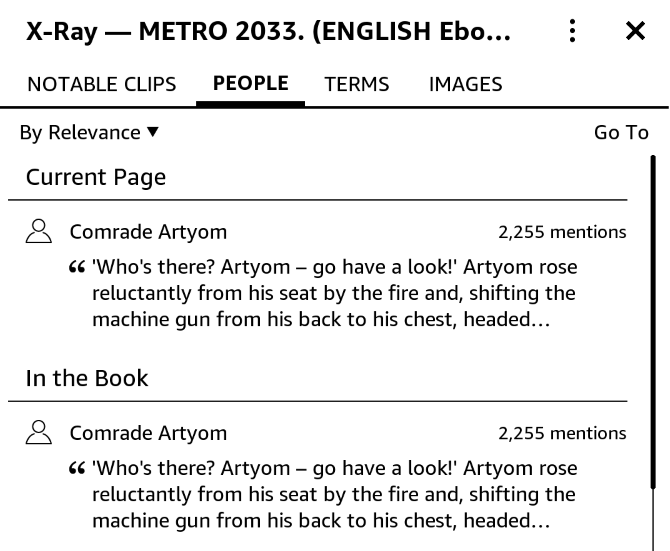 Notes & About This Book: Toggle Popular Highlights and Public Notes that show you popular passages and notes highlighted by other users. You can also disable the About This Book popup that displays when you open a new book for the first time. Language: Change the language from the one you set when you got your Kindle. Keyboards: Add a keyboard for a second language. 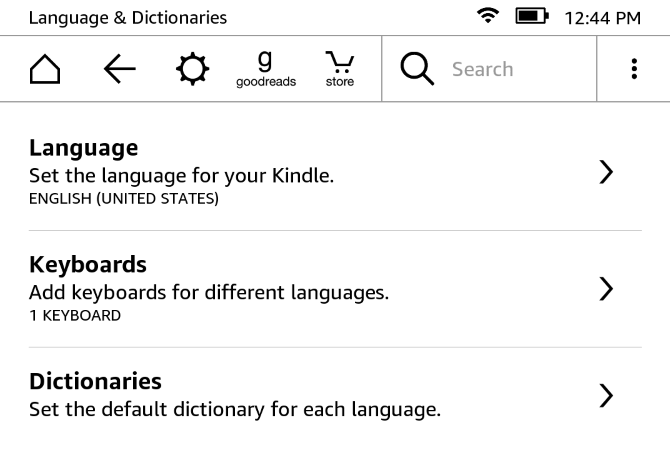 Dictionaries: Set the default dictionary for each language on your device. Kindle Freetime: Set up the FreeTime feature that we discussed earlier. Restrictions: Turn off access to the web browser, Kindle Store, Cloud, and Goodreads to restrict what your kids can do. Disabling any of these requires setting a parental controls password. Change Password: Edit your parental controls password. This appears grayed out if you don’t have a password set yet. Be aware that your child could find a way to bypass the parental controls. If you’re really, really bored, you can read 339 pages of legalese. But you should probably just find a better book to read instead. We’ve covered the whole setup process and nearly everything you can do with your Kindle Paperwhite. There are just a few extra bits you should know before you go. Your Kindle has an electronic paper screen (read more on Wikipedia). This means that it looks like real paper, unlike a traditional tablet or phone screen. Also, the front-lit display means the light shines on the page, not in your eyes. Thus there’s far less strain on your eyes, and you don’t have to worry about blue light keeping you up at night. You also don’t need to worry about e-Ink burning into the screen. When you put your Kindle in sleep mode, it displays a screensaver but the image doesn’t change. An e-Ink screen displaying a static image uses hardly any battery life — re-drawing the page is what uses energy. You might notice a “ghost” image sometimes when the screen refreshes. This is normal, and refreshing the display a few more times will clear it up. Your Kindle will automatically go to sleep if you don’t take any action for several minutes. When you’re done using it, though, you should put it to sleep manually. You can do this by tapping the Power button on the bottom of the unit. When you press it, the Special Offer screensaver appears and your backlight will turn off. If you have a magnetic case for your Paperwhite, closing the cover will activate sleep mode as well. You can completely turn off your Kindle by pressing and holding the Power button for about five seconds. When powered off, the screen goes blank. However, you don’t need to do this unless you plan to have your Kindle off for a long time. The device uses minimal battery in sleep mode — the backlight is off and a static image displays. If your Kindle ever freezes, press and hold the power button for 10 seconds or more until it restarts. A single charge lasts up to six weeks, based on a half hour of reading per day with wireless off and the light setting at 10. Battery life will vary based on light and wireless usage. You probably won’t be away from an outlet for weeks at a time. But just in case, there are a few steps you can take to minimize battery usage. Unless you’re downloading a book or using the browser, keep Airplane Mode on so your Kindle doesn’t try to communicate with the internet. Also, reduce the brightness of your device as much as you can comfortably. In bright light, you probably won’t need the light at all. The Kindle Paperwhite has 4GB of internal storage. While this doesn’t sound like much, a Quora user has run the numbers to come up with approximately how many books this lets you hold. 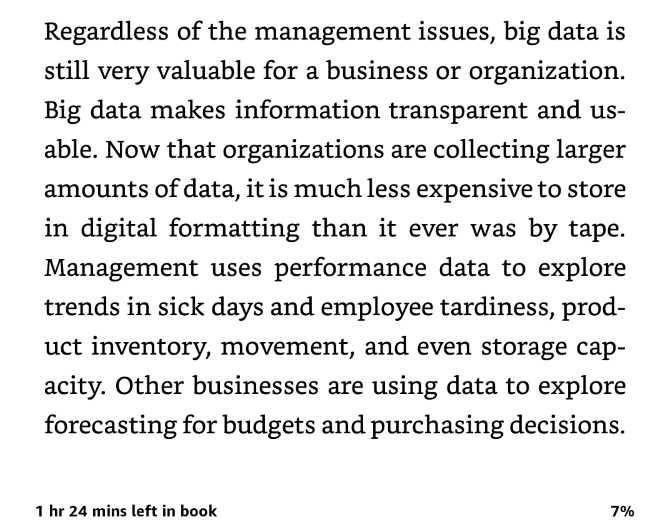 In short, he found that the average eBook is about 1.87 MB. Considering about 3GB of your Kindle’s space is usable, that means you can store around 1,600 books. So don’t be afraid to grab samples and take chances on deals — your Kindle can hold them! You probably bought a Kindle model with Wi-Fi access only, since it’s cheaper. If that’s the case, you can only download books and access the web when you’re on Wi-Fi. Models with 3G access can download new books as long as they have a signal. 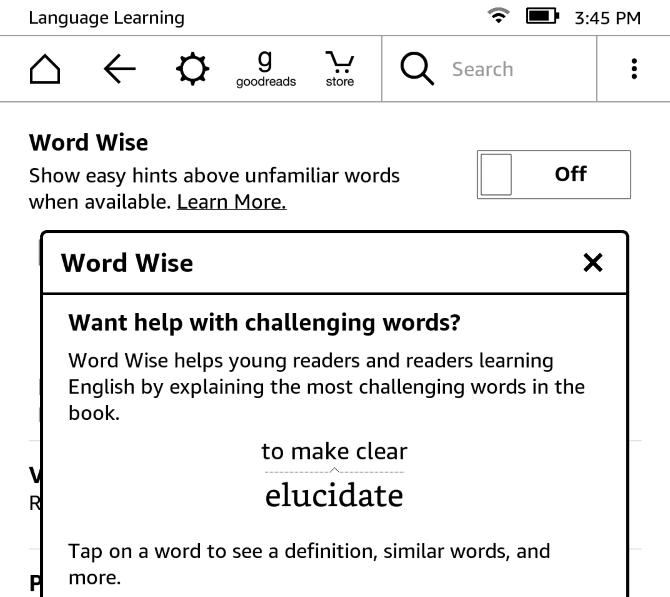 Word Wise is a neat assistance feature that helps you with difficult words. Open a book, then tap the top of the screen to expose the toolbar. Tap the Menu three-dot button and then hit Word Wise. It’s turned off by default; change the top slider to On to enable it. Now, your Kindle will show synonyms for tough words so you don’t have to manually pull up their definitions. You can even use your Paperwhite to learn a language if you want. During your time with your Paperwhite, you may run into some problems. We’ve collected the most common issues here so you know what action to take when they pop up. As we mentioned elsewhere in the guide, the e-Ink screen can sometimes leave a faint image of what was on the screen before. Unlike the burn-in on smartphone screens, this is temporary and shouldn’t cause you any concern. Refreshing the screen will clear any ghosted image. To do this anywhere, just tap the top of the screen to open the toolbar, then tap below it to close the toolbar. 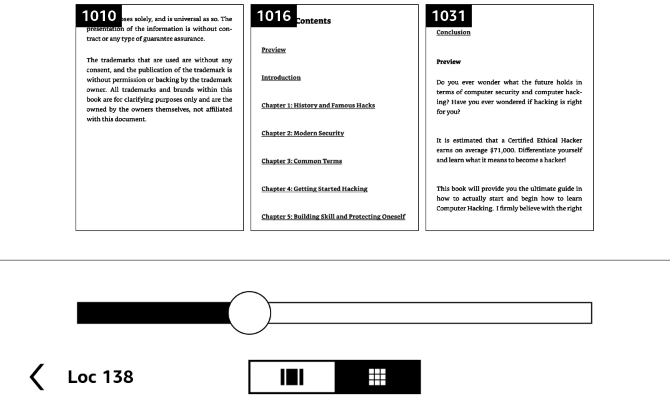 When reading, your book will refresh the display every few pages as well. Once you’ve added a Wi-Fi network to your Paperwhite, it should connect automatically whenever you’re in range. But if it doesn’t connect, you may have to add the connection manually. To do this, open the Toolbar and tap All Settings. Look under the Wireless tab and make sure your current network is listed with a check mark next to it. If you see the check mark but still can’t get online, tap the name of the network. Your Kindle will then ask if you want to forget this network. Choose Yes and then re-establish the connection by tapping it again and entering your password. Should you still have issues, try rebooting your Kindle and then your home router to make sure the problem isn’t larger. 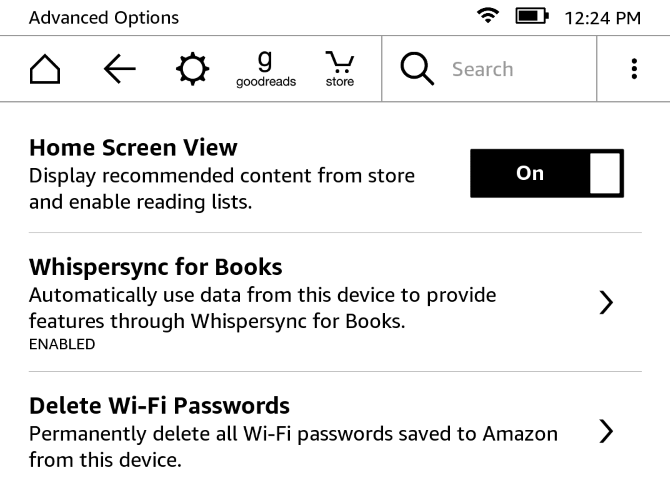 Amazon’s Whispersync service allows you to keep your reading in-sync between devices. Thus, if you read a few pages of a book on your iPad, Amazon syncs this progress to your Paperwhite so you’re ready to continue where you left off. If this isn’t working properly, make sure you’re online as we discussed above. When your Kindle is in airplane mode, it’s not connecting to the internet and syncing this information. Also, check to make sure Whispersync is on. Navigate to the Your Content and Devices page, then click the Settings tab. Scroll down and make sure Device Synchronization is On. You shouldn’t turn this off unless you and another person are reading the same book using the same account. It’s super-convenient unless you fall into this specific use case. If you’d rather have the books in your library appear in a different order, tap My Library on the Home screen. In the upper-right corner, you’ll probably see Recent. You can change this to Title or Author if you prefer. You can also tap the All Items header and change the display from Grid View to List View. 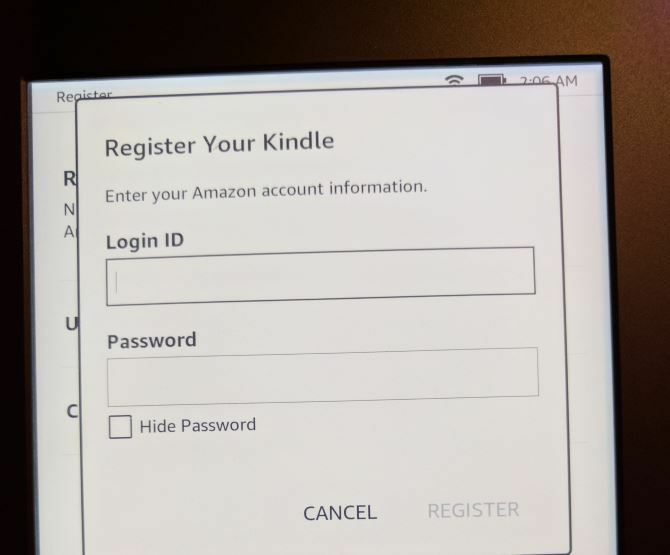 Adding a password to your Kindle means you can’t get in without entering it. If you added one and forgot the passcode, you can reset your device with a special code. Note that this will remove all your personal information and content on the device. But since everything is synced to your Amazon account, you can re-download all your books in no time. To enter the master reset code, tap the passcode field and enter 111222777. This will reset your device to factory defaults. Refer to the start of the guide for instructions on setting it up again. Kindles use the MOBI format, but EPUB is more common around the web for free eBooks. Your Kindle can’t read the EPUB format natively, but using a quick conversion, you can make sure those books work on your Kindle. The tool for the job is Calibre. Install it on your PC for free, then you can walk through the process to convert EPUB books. Click Add Books at the top and select the books you want to convert from your computer. Then select a book from the list and choose Convert Books — make sure the Output Format field in the top-right is MOBI, and click OK.
Give Calibre a minute, and you can Save the revamped book to your PC. The best way to send these to your Kindle is via email. Visit the Manage Your Content and Devices and click the Your Devices tab. Select your Kindle and click the button below Actions next to it. You’ll see a pop-up menu with an email address @kindle.com. 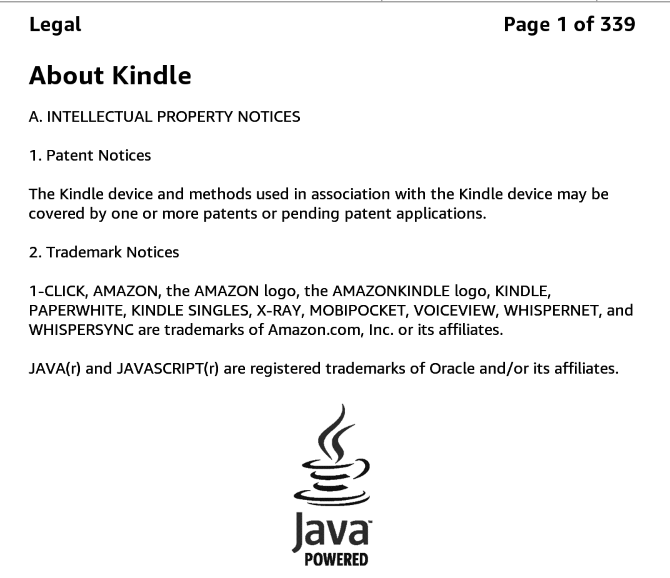 Any document supported by Kindle that you send to this email will appear on it. This is a lot more convenient than connecting a USB cable to your device and transferring them manually. Wait a bit, and you’ll see your fresh MOBI books ready to read on your Kindle. What Will You Read First? 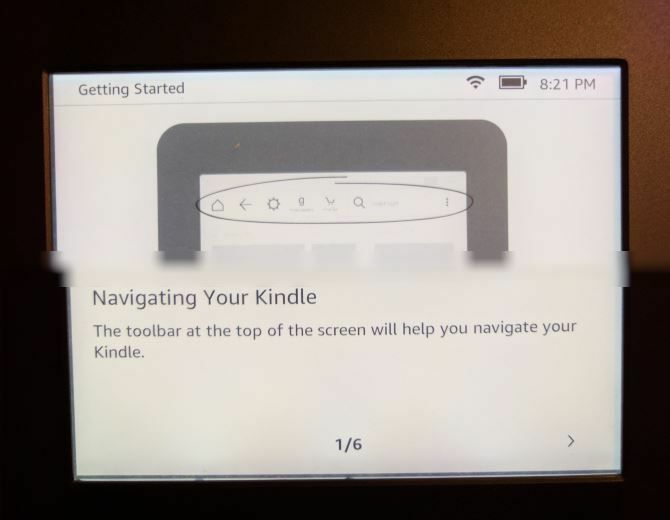 If you’ve reached this far down the page you should know everything you could need to set up and use your Kindle Paperwhite. We’ve covered setting up your device, buying and reading books, using the advanced features, changing your settings, and various odds and ends. If you have a question not answered in this guide, head to My Library on your Kindle’s Home screen and look for the Kindle Paperwhite User’s Guide. 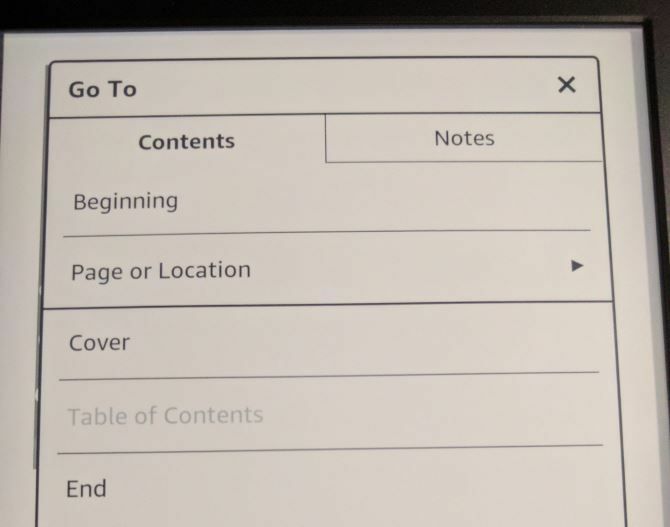 This built-in eBook contains instructions for all your Kindle’s features. Once you’ve got a bunch of books, check out these apps every Kindle Reader should use and also find out the best way to organize them all. What aspect of the Kindle Paperwhite do you enjoy most? Have you read any good books on your Kindle yet? Please tell us what you think of the device, how useful you found this guide, or ask any other questions you have in the comments below! wow! this is the most detailed tutorial and comprehensive description of Kindle Whitepaper I’ve ever read. This is very helpful for me. I love the advanced feature which allows the setting of reading goal for children as well as the vocabulary builder. This is great. I will definitely buy this model. I like reading about investment strategies books using my kindle. I can see you love reading books of different kinds. Can you recommend some good investment ebooks? I’m glad you liked the post and the features Kindle Paperwhite has. Although I do read many books, this is not a blog for book reviews. It is about the technology that allows you to read and write/publish ebooks. So, I can not answer your question about investment books. If there are any questions or requests on the technology, I’d be glad to help! I’m glad you liked the post, and that you’ve found it useful. If there is anything else I can help you with, please let me know! This blog is about the technology behind ebooks. Not the books per se. So, I can’t offer you any recommendations. Loving this great guide on the Kindle you have left nothing out. Its perfect to set as a favourite for future reference. You have totally spared me having to work all this out myself. Now I can just enjoy my reading….perfect! Its a bit surprising the kindle white does not come with a usb plug, can be somewhat inconvenient for those who dont have a pc to charge into hey. Thanks for providing a useful to purchase one. True that with the USB cable. But, most of us have a USB charger somewhere (from other electronic devices), so I never considered that a problem. Nevertheless, I had to give a solution for people who don’t have a USB plug. Its well detailed and takes you step by step on how to use a Kindle Paperwhite right from unboxing to Kindle settings. Me personally I’ve never owned a Kindle tablet before but after reading your review I’m inclined to pick one up. Just like you, I enjoy reading which is why I would like to know the price of a Kindle Paperwhite tablet. So I can get one before the summer begins. I like reading books as well as ebooks. I find them complementary to each other. I’m glad you liked the post. Wow, what an extensive guide indeed! I thoroughly appreciate the research you must have done to gather and compile so much information. I will have to go back to it a few times just to grasp all of that information. You definitely have done your research. I was not expecting so much in-depth & detailed information. I really enjoyed the content and in the manner that you presented. Being a writer I read more books, I am really interested in kindle paperwhite and planning to buy one very soon. 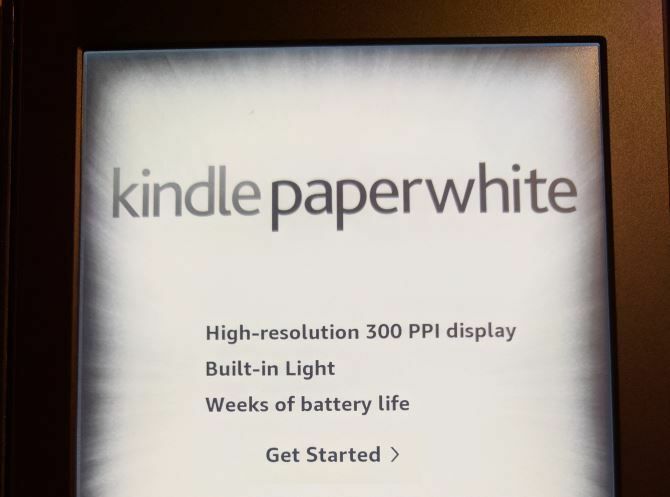 While browsing about it I came across this helpful guide and you left no stone up-turned in explaining how it all works and how to set up kindle paperwhite. As always you covered all the details and every single time I read an article of yours I learn so much new stuff! I am bookmarking it for future reference. I enjoyed how step by step your explanations were. It made it so incredibly easy to manage. Thank you for all the other insights as well! Have a Wonderful Day! Kindle has a lot of goodies regarding reading. Goodreads, vocabulary and Free Time are some of them. I use it daily to read, discover and purchase books. You should too. I feel some of the stuff you went over was pretty basic. Regardless, there were many insights I had no idea about. So, for the same of completeness and to appeal to all audiences, I feel with the article you have done such an amazing job. What I really appreciate is the photos you added. I’ve seen way too many blogs that try and explain it through text only (or scarce amounts of images), which is not always easy to understand and thus ideal. In the case with your article though, very ideal.